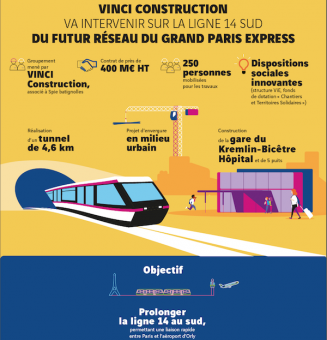 Consortium led by VINCI Construction, together with Spie batignolles, wins a new contract on the metro Line 14 South as part of the future Grand Paris Express rapid transit system. The consortium led by VINCI Construction (Dodin Campenon Bernard, lead company; VINCI Construction France; VINCI Construction Grands Projets and Botte Fondations), together with Spie batignolles (Spie batignolles Génie Civil and Spie batignolles Fondations), has been awarded a major contract as part of the Grand Paris Express programme. The RATP has selected this consortium to execute works package GC02 of the future Line 14 South between Olympiades (in the 13th arrondissement of Paris) and Orly Airport. 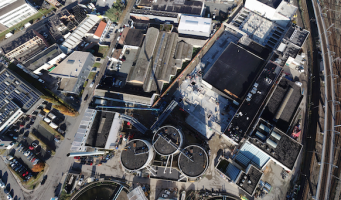 The contract, worth almost €400 million (excluding tax), requires the use of an earth pressure balance tunnel boring machine to excavate a 4.6 km tunnel between Maison Blanche Paris XIII futur station and the TBM starting shaft at Jean Prouvé. It also includes construction of the new Kremlin Bicêtre Hôpital station and five ventilation and emergency shafts. 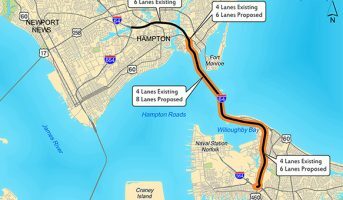 The contract is scheduled to last 72 months. The GC02 works package site cuts through Paris, Kremlin Bicêtre, Gentilly, Villejuif and L’Haÿ-les-Roses. It also passes near Kremlin Bicêtre Hospital and the A6 motorway. Integrating the worksite into this environment is a major challenge that has led to numerous consultation meetings being held between the RATP, the Société du Grand Paris (SGP) and all the cities, local authorities and residents involved. This package’s works will create almost 250 jobs. Significant measures are planned for the integration of around 50 long-term unemployed people, with some 83,000 hours of training and support to be provided over the course of the project. In 2011, VINCI set up ViE (VINCI insertion Emploi), an entity specialising in social and professional integration, to help Group companies with this aspect of their contracts. 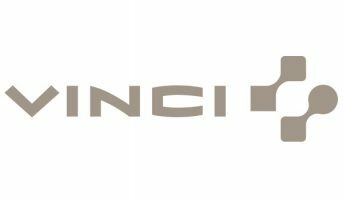 In addition, the “Chantiers et Territoires Solidaires” endowment fund created by VINCI will support public interest projects implemented in the vicinity of the worksites. Spie batignolles is also strongly committed to facilitating the social and professional integration of marginalised people, notably through its Fondation Spie batignolles. A missing link between central Paris and Orly Airport, the Line 14 South will be used by more than 260,000 residents of Paris and the Val de Marne and Essonne départements. It will provide connections with metro Line 7, Line C of the Paris RER regional express system, Line 7 of the tram system and Lines 15 South and 18 of the Grand Paris Express rapid transit system. It will create a fast link between Paris and Orly Airport, which is essential for 2024 when the city will host the Olympic Games. VINCI Construction and Spie batignolles are participating in the extension of Lines 4, 12, and 14 of the Paris metro, which is managed by the RATP. In addition, VINCI Construction and Spie batignolles, in a consortium, have won works packages T3C (€926 million) and T2D (€156 million) for Line 15 South of the Grand Paris Express programme, which is managed by the SGP.